I previously looked into potentially effective ways to donate to health research, including leading causes of death/poor quality of life. I’ve been looking into this again and have a few updates. I haven’t thoroughly vetted every one of these organizations, and I welcome further feedback — but I’ve spent a few hours researching. And for cancer research and Parkinson’s research in particular, I feel quite confident about these recommendations. The Cancer Research Institute easily wins the award for the best cancer research charity. CRI net over $25 million in funding during 2016, and uses 87% of those funds to support immunotherapy research. CRI is a great charity because—aside from supporting many scientists with funds—they also run a clinical accelerator program which gets the best ideas from the laboratory into the clinic as fast as possible. In total, CRI has funded over 120 clinical trials and invested over $344 million over the course of its existence. Consumer Reports concurs with this recommendation, based on high ratings from BBB Wise Giving Alliance, Charity Navigator and Charity Watch. With proven impact over time, the CRF is an excellent research charity to consider donating to. Unlike the Cancer Research Institute, I didn’t immediately find other coverage/analysis of this foundation — in part because it’s a private foundation and thus not covered by tools like Charity Navigator. But it’s encouraging to see evidence of efficacy over time. 2017 has been a particularly stressful and disaster-filled year for many people. So this year, I wanted to do something extra in addition to my normal charity recommendations. I’m still providing recommendations, but this year, I’m also providing some matching funds. The above links go to fundraising pages at Crowdrise, a site endorsed by these three charities for raising funds. At each of the above links, I’ve explained my choices of charities in detail, including the risks, benefits, and alternatives to donating. So far I’ve found donors willing to match up to $2000 for each charity — and if we meet that goal, perhaps I can get more. If we prove that this works, there are other potential matching donors may be willing to jump in and increase that amount. I’ve also updated my recommendations spreadsheet that I started earlier this year. 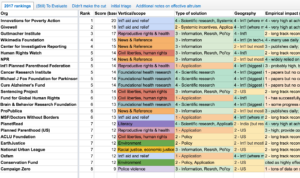 It contains my rankings for 26 charities I’ve researched (for a wider set of causes), and it contains notes about why I ranked the charities the way I did. So if you have different priorities than I do, you should hopefully be able to create your own ranking accordingly. You can also read my thinking and recommendations from past years, much of which still holds. The good news, though, is that my donation research mega-spreadsheet should still be applicable in ~10-11 months when I am next donating. And for everything subjective, I tried to document everything I was thinking along the way so that others (and future me) can adjust the conclusions according to taste or according to anything that’s changed. I’ll reshare it on various social networks when it’s “giving season” again. You may not agree with the list of charities I’ve evaluated so far (in which case I’d love to hear what you think I left out — though please see my To Evaluate and Didn’t Make the Cut tabs). You may also not agree with my criteria or weighting (heck, I’m not sure I agree with those :) ), and I’d love to hear your thoughts and feedback on that as well! I’ve tried to clearly document my thoughts, in any case, so that if your priorities are different, you can change your rankings accordingly. I scored and ranked the organizations (to be taken with a large grain of salt! mostly it’s not the rankings but the other info that’s useful), but I’m not quite sure how I’m going to use this info to allocate funds. Some charities that score really well in terms of excellence might not actually get the most money… I’m still pondering how score and amount should relate. And still considering what other factors should perhaps be going into my rankings. Sorry this post arrives so late in the year, probably after most of you have already made your charitable year end donations. However, I’m following my own advice — see my final point below. Are you fortunate enough to be able to donate resources to others this year? If so, here are some ideas for how to maximize the effects of your donation. Some of these are suggestions for specific charities. But whatever causes and charities are most important to you, there are ways to make your giving more effective — and some of these suggestions apply to all donations. Do you want your donation to have a large, empirically proven impact? I’ve talked before about how much I admire GiveWell and Innovations for Poverty Action, which are effectivist organizations to the core — both organizations do empirical, in-depth evaluations of the impact of charities. This year, the press is taking notice as well; Vox and Wall Street Journal columnist Jason Zweig both wrote about how these organizations help your charity dollars go farther. For those seeking our recommended allocation, we simply recommend giving to the top-ranked charity on the list, which is AMF. Another organization, The Life You Can Save, has an overlapping top charities list — along with a very useful Impact Calculator that lets you see the impact of a donation to each charity. I don’t endorse this organization as strongly as the others, because I don’t know as much about it (it was founded by ethicist Peter Singer; I don’t believe it does the same degree of rigorous evaluations as the two sites above, but it does depend on some outside evaluations), but a number of these charities have been endorsed by the other two sites, and the Impact Calculator is great. As the end of the year approaches, I’m revisiting my old strategies for donating money, and deciding where to donate this time around. This year, I’m starting with where not to donate, starting with the American Red Cross. During Isaac, Red Cross supervisors ordered dozens of trucks usually deployed to deliver aid to be driven around nearly empty instead, “just to be seen,” one of the drivers, Jim Dunham, recalls…. During Sandy,emergency vehicles were taken away from relief work and assigned to serve as backdrops for press conferences, angering disaster responders on the ground. I’m going to try to attend this online event and cover any new info for this blog (I’m hoping to do an updated giving guide this year), but it will depend on my schedule that day. I encourage others to attend if interested! I like a lot of what you wrote, but here’s a criterion I didn’t see there, but which makes sense to me: if huge funding sources are already available to a project (e.g. Gates Foundation) I’m pretty sure my impact will not be that significant. It might make more sense to focus on organizations that do not (or do not yet) have such resources available to them. I think this is a very good point. I think it’s likely that a lot of organizations without funding from large foundations may not have funding because they don’t have much evidence of effectiveness. But that’s surely not always true, and all other things being equal, your contribution will go much further in an organization that doesn’t have huge grants. where should I donate money? As the year draws to a close, I am trying to decide where to donate money, and feeling grateful that my company is generous enough to match my donations. There are lots of guides for how to give wisely out there: (e.g., GiveWell’s basic, advanced, and now vs. later analysis; GivingWhatWeCan’s tips; CharityNavigator — caveat: why effectiveness, not efficiency, should be the focus of donations). Many experts and evaluative organizations have also made endorsements for where to give (e.g., GiveWell’s top three charities, Coalition for Evidence-Based Policy’s list of social programs that work, Philanthropedia’s top charities in many categories). Effectivism has also covered methods for evaluating charities multiple times. Despite these tips, I’ve spent probably around 30 hours in the past few months trying to decide where and how to donate money this year. I decided to show my work in case it’s useful for anyone else who’s trying to prioritize. I’m not saying anyone else should have the same principles or choose the same charities. But perhaps my thinking will help you with your own. I continue to have a huge blog crush on Do The Math, especially the analyses of how to reduce personal energy use. While some of his findings are shocking (shrimp are one of the least energy efficient foods? Say it ain’t so! ), many of his methods for measuring and drastically reducing energy use are inspiring. I’m not currently willing to take some of the steps he does (e.g., solar panels, or completely turning off my heat), but many of his methods can be applied in moderation, and I’m a big fan of his emphasis on starting by measuring where your big expenditures are. Freakonomics had a recent podcast about the effectiveness of herd mentality in persuading people to make changes such as reducing energy consumption or water usage. Telling someone, “Most of your peers are doing it,” is often one of the best ways to influence people’s behavior. Conversely (and counterintuitively), telling people, “Please don’t do X, because lots of people are doing X, with terrible consequences,” often encourages people to also do X.
GiveWell’s new list of top-rated charities is out. Freakonomics recently had a podcast called What Makes a Donor Donate? (link includes podcast and transcript.) It’s short and full of interesting (and sometimes counterintuitive) facts about the effectiveness of seed money, matching donations, raffles, and letting donors opt out of future solicitations. For those who want to dig deeper, John List, one of the guests of the Freakonomics podcast, studies the economics of charitable giving. He has a set of research papers full of empirical evidence about various fundraising tactics. These publications look both interesting and useful for those trying to effectively raise money for a cause. Copyright © 2011 Effectivism. Powered by WordPress and A Dream to Host theme by Art of Blog.